A while ago Powershell Desired State Configurations (DSC) was introduced. Powershell DSC allows you to create a configuration of a specific machine in a powershell file. The Powershell engine takes care of rolling out this configuration. 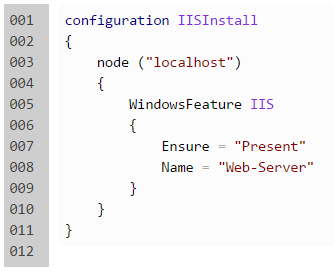 This configuration snippet makes sure a IIS is present. If it already is it stops, if not, it installs it. Powershell DSC is a great way of scripting your machine configurations and eventually crucial for enabling Continuous Delivery. First I wanted to download an ISO file. From an URL. In my case some location on AzureStorage. "$env:ProgramFiles\Microsoft Team Foundation Server 12.0\Tools\TfsConfig.exe"
-PassThru | Get-Volume).DriveLetter + ":"
throw "Could not mount TFS install iso"
$cmd = "$setupDriveLetter\tfs_server.exe /install /quiet"
Write-Verbose "Command to run: $cmd"
Write-Verbose "TFS server already installed"
Write-Verbose "TFS server is not installed"
Once the Build server has been installed you need to configure the Build Controller and agents. This cannot be done with a standard TFS Commandline. For this purpose I wrote an Powershell CmdLet (wonderful resource here). 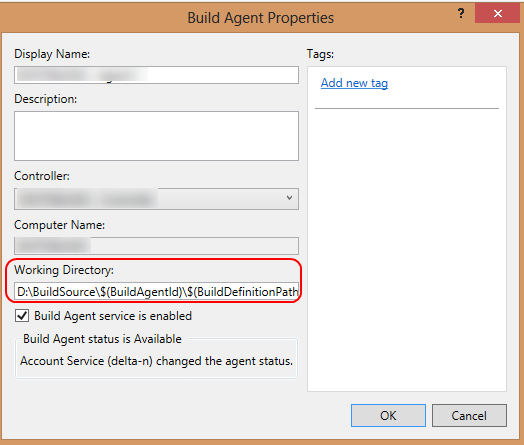 This can be called to configure the Assembly location of the Build Controller and the Source location of the Build Agents. Of course you can wrap this in a DSC as well. Use the Script Resource configuration for this as well. Once you have assembled your DSC, call it as a function and run the Start-DSCConfiguration Command to execute it. #Call Configuration, Builds a "package"
This creates a package and executes it. As you can see Powershell DSC has a lot of possiblities to execute powerful stuff. Dive into it and start doing it now. resource exists and the name is properly formed. Errors occurred while processing configuration ‘TFSAutomation’. Below is my script which I m trying to execute. You state DependsOn = “[File]TFSServerIso” but I do not see a [File] configuration in your script..
TfsConfig needs an elevated Command Prompt window on Windows server 2012. How did you bypassed it? Don’t exactly remember. It just worked when running from RM. How did you configure the Build feature in TFS after running the tfs_server.exe? 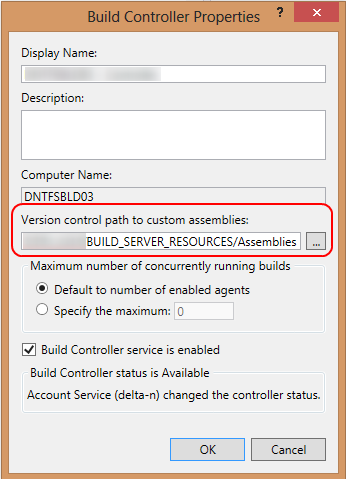 You still need to open the TFS Administration Console and click on Build Configuration, Configure Installed Features then you can configure the custom assembly path.